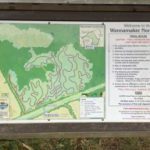 The Wannamaker North Trail is a combination mountain bike/ hiking trail with multiple trail options. The trail head is not located within Wannamaker County Park and is accessed in the city of Goose Creek off of westview blvd. Of all the trails loops at the Wannamaker North Trail the Yellow loop is probably the most hospitable for hiking with young children. 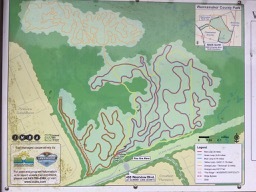 It is 1.75 miles in length and though some spots have lots of roots and mud can be expected with recent rains, All-terrain strollers can make it along this trail. A child carrier is a good idea if you want to avoid a bumpy stroller ride or for children who may tire before the entire 1.75 miles is completed. Due to the densely wooded nature of this trail I would recommend it for fall, spring and winter, avoiding summer because of the number of mosquitos and ticks. Also note, there are no restroom facilities or water available at this trail, however the trail head is within 1.2 a mile from restaurants, gas stations and grocery stores. 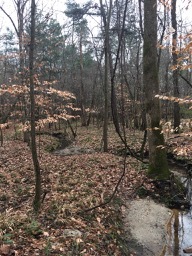 This is an entirely wooded trail through forest. Sections of mud will likely be present and the trail closes after a heavy rain. The parking lot is clearly visible from Westview Dr. 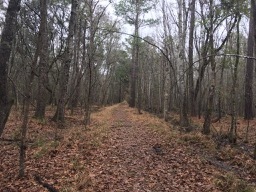 Note: This trail is NOT accessed from Wannamaker County park, the trail head is located about 5 miles from the gate of Wannamaker County Park in Goose Creek.